An Annual General Meeting is a gathering of the general participation of an association. These associations incorporate enrollment affiliations and organizations with investors. These gatherings might be required by law or by the constitution, sanction, or by-laws administering the body. The meetings are held to lead the business in the interest of the association or organization. An organization may conduct its business at the annual general meeting. The business may include electing a board of directors, making important decisions regarding the organization, and informing the members of previous and future activities. At this meeting, the shareholders and partners may receive copies of the company’s accounts, review fiscal information for the past year, and ask any questions regarding the directions the business will take in the future. 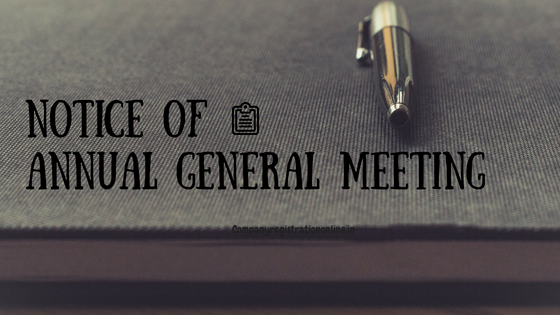 At the annual general meeting, the president or chairman of the organization presides over the meeting and may give an overall status of the organization. The secretary prepares the minutes and may be asked to read important papers. The treasurer may present a financial report. Other officers, the board of directors, and committees may give their reports. Attending this meeting are the members or the shareholders of the organization, depending on the type of organization. To receive, consider, approve and adopt the audited Balance Sheet as at March 31, 2019, and Statement of Profit and Loss Account for the year ended on that date together with the reports of the Directors and the Auditors thereon. To appoint a director in place of Mr. _________, Director (DIN:_______________) who retires by rotation and being eligible, offers himself for re-appointment. To appoint a director in place of Mr. _________, Director (DIN:_______________) who retires by rotation and being eligible, offers herself for re-appointment. To appoint Statutory Auditors and to fix their remunaration and in this regard to consider and, if thought fit, to pass with or without modification(s), the following resolution as an Ordinary Resolution. The retiring auditors M/s. ___________________, Chartered Accountants (Firm Regn. no. _________________) are eligible for re-appointment and have confirmed their willingness to accept office, if re-appointed. You can also send notice of Annual General Meeting by electronic mode . If you want to apply for Private Limited Company Registration, you can go with Company Registration Online.